PlayUp Tools Alpha version 0.9.9.0 is now available. How many times have you hit the export level icon accidentally and had to wait for the process to complete before you could get back to your work? Well now users will have a chance to cancel the export. 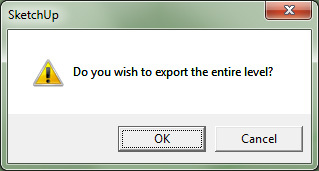 In both cases, hitting "Cancel" will cancel the level export process as well. It is important to note that you MUST SAVE YOUR SKETCHUP FILE after changing and saving the layer name in your preferences. This is because every new layer name generates a unique ID number that is being stored in your SketchUp file. If you close your SketchUp file without saving it, then the unique ID does not get saved. CryENGINE 3 requires every layer to have a unique ID, and not just a unique name. In the example above, let's say you change the layer name to "Props.lyr", export the level, and forget to save the SketchUp file. The next time you open and export that Props layer, it will end up on a 2nd "Props" layer in CryENGINE 3, even though it may share the same name as the first one you exported. Unlike custom-named layers, the default "PlayUp" layer is different in that the unique ID is not generated, but is the same across all SketchUp files.